Is Screen Time Like Digital Heroin? Earlier this week, a provocative article came out in the NY Post titled It’s Digital Heroin: How Screens Turn Kids into Psychotic Junkies. The author, Dr. Nicholas Kardaras, presented brain imaging research showing screens impact the frontal cortex the same way that cocaine does. Additionally, he described kids becoming “bored, apathetic, uninteresting and uninterested when not plugged in.” Similar results have been described in many research papers and articles. He described kids becoming “bored, apathetic, uninteresting and uninterested when not plugged in. Over the past several years, I have taken a keen interest in this topic and have learned a lot through research, listening to parents discuss their experiences, and observing kids who spend a lot of time on screens and kids who don’t. As their brains become more consumed by their virtual worlds, they are less interested in the types of activities that are so important for physical, intellectual and social development. On the other hand, the kids I have seen who engage in little or no screen time are some of the most creative, well-mannered, and happy children around. I don’t hear “I’m bored” come out of their mouths often or if ever. Instead, they find many interesting things to do at home and when they are out with friends and family. They aren’t thinking about a screen because it is not part of their routine or a big part of their day. Kids are more likely to be creative and social at home when they can’t jump on a computer whenever they want. I believe excessive screen time and physical inactivity are responsible for many kids’, though certainly not all, ADD and ADHD diagnoses. Children as young as kindergarten and 1st grade are now being prescribed psychotropic drugs like Ritalin so they can sit still in class and not be disruptive. Before I put my children on any type of mind-altering drug, I would do some heavy-duty research about long-term consequences and other side effects. Furthermore, I would go cold turkey on screens and spend copious amounts of time out in nature before even considering those drugs. I would also look at educational alternatives such as homeschool before my kids began ingesting them. I am not anti-screens with my kids. Though, I admit, I always cringe a little when I see they are playing a computer game. They earn their screen time just like a person earns a paycheck. For a full load of school work and chores, they earn 25 minutes per day. If they have less work then their earned screen time decreases. I don’t ban it altogether. Sometimes things become even more desirable when they are entirely forbidden. I do not buy the argument that video games are good because they help you to understand technology. On the other hand, strategic use of technology has great benefits. I welcome teaching kids how to use technology to make them more productive and professional. I do not buy the argument that video games are good because they help you to understand technology. I agree there is excellent technology to enhance work and learning. I embrace that. However, sitting around playing video games is not an effective tool in teaching one to use effective technology. On the other hand, strategic use of technology has great benefits. I’m teaching a blogging and 21st-century skills class at our homeschool co-op in the fall. We will incorporate some strategic uses of technology including creating and delivering Power Point presentations, developing blogs, conducting research and graphing it with Google Sheets and much more. I welcome teaching kids how to use technology to make them more productive and professional. This is a smart use of technology in my opinion. I am not a doctor. I am sharing my opinion for your consideration. I believe this information is important with all my heart. I urge you to do your own research on this topic and draw your own conclusions. If your screen-addicted kid’s behavior is not satisfactory by your standards or is not interested in too much beyond his tablet, consider setting limits or getting rid of it altogether. I think 30-45 minutes per day is more than enough. You may try going cold turkey for 3 months. I bet you’d be surprised how your child started to find the world and other people interesting again after getting over the initial shock of losing screen time. 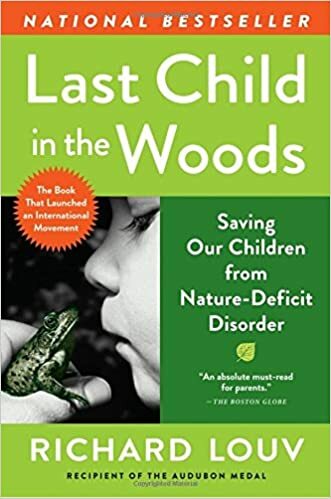 One of the most important and impactful parenting books I have ever read is The Last Child in the Woods:Saving Our Children From Nature-Deficit Disorder. I wish all parents would read it. You can buy it on Amazon through this link here or perhaps get it at your library. You can sign up to follow The Contemporary Homeschooler via email by clicking on the Follow button. Also, join our community on Facebook as I post much more content than what is on my blog. This can easily be incorporated into your homeschooling! You have the freedom to make it happen! Let your kids play in the dirt! Time to get off those screens and get their hands dirty! Some of our best family conversations are while driving. This excerpt does not even mention how we all benefit in communication and relationship building without gadgets in the car. Some of our best family conversations are while driving. Most of the time everyone is relaxed and either being silly or discussing meaningful topics. I love our family time while driving. We find all kinds of natural treasures on our nature walks. Here is a rattlesnake skin. *First: A bored child often needs to spend time with a parent or other positive adult. They need to be there for their kids, to limit the time they play video games or watch TV, to take them to the library or on long walks in nature, to take them fishing–to help them detach from electronics long enough for their imaginations to kick in. They need to be there for their kids, to limit the time they play video games or watch TV, to take them to the library or on long walks in nature, to take them fishing–to help them detach from electronics long enough for their imaginations to kick in. 1) Loss of will to do other things–They become unmotivated to do different activities because they are so entranced by being on the computer. We know one family whose son is in high school and won’t do anything at all but screens. No Scouting, no sports, he can’t concentrate to read, etc. So she has gone cold turkey from screens and is in a Waldorf school with her elementary-aged boys. 2) Psychiatric problems with ADD, ADHD, depression and anxiety. There are so many links here. Also, if someone told me I had a child who needed to be on psychiatric drugs then I would go cold turkey on screens and spend lots of time outdoors with lots of exercise before going this route. I would try this for several months. I have a family member who has been through hell with these drugs. Over the long run, the side effects can be devastating for the person and the family. Overall, I am happy to let my kids have some screen time per day.They earn it just like a person earns a paycheck. It motivates my son to get his work done while my daughters are not really interested. If you ban something altogether, then they may go the opposite direction when they have the ability to do so. I do not buy the argument that videos and screen time are good because they help you to understand technology. I agree there is excellent technology to enhance work, learning, etc. Lots of fantastic stuff, and I embrace that. However, sitting around playing video games is not an effective tool in teaching one to use effective technology. On the other hand, strategic use of technology has great benefits. I’m teaching a blogging and 21st-century skills class at our homeschool co-op in the fall. We will incorporate some strategic uses of technology.